Whether we want to admit it or not, back to school is coming. Adalyn won't be going to school quite yet but my husband will! He is starting his sixth year as a teacher and this year, is teaching honors physics, earth science, regular physics and astronomy. With 4 classes to prep, during the school year is very busy for us. 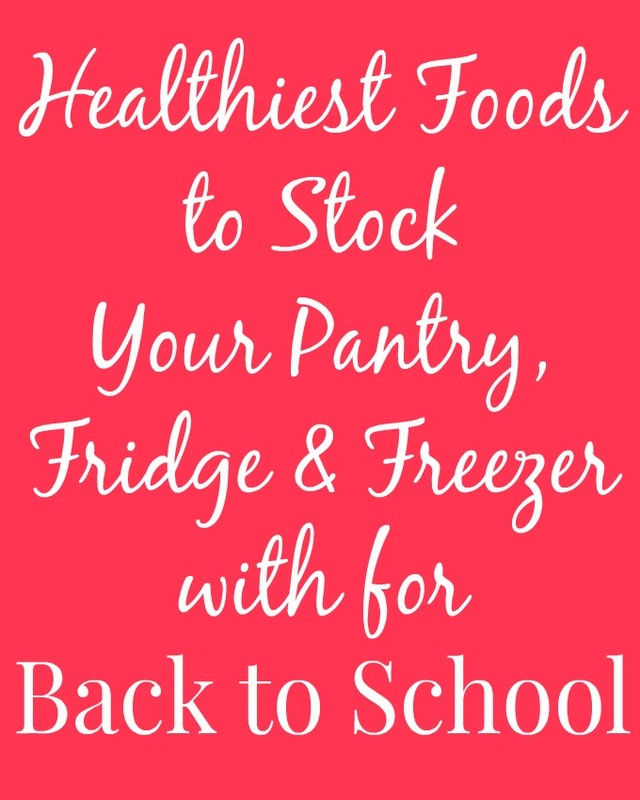 Therefore, I like to stock up our fridge, freezer and pantry for back to school to make cooking and healthy eating as easy as possible. I pack our lunches every day, we both bring a breakfast from home and then eat dinner together as a family. Healthy eating is important to me year round and to make the back-to-school hustle easier, I make sure that I have most of these foods on hand. -Milk- we buy 2% for Adalyn and for our coffee, cooking, etc. -Hummus- I often buy pre-made hummus or whip up a quick batch of my own. It takes 5 minutes or less. -Vegetables- I like to keep a ton of vegetables on hand for loaded salads, stir-frys, for grilling, etc. -Shredded cheese- we always keep shredded cheese for nachos, pizza, tacos, egg sandwiches, etc. Made healthy at home of course. -Leftovers- during the school year, we make large quantities of food when we cook so that we have leftovers for lunch. Troy used to take sandwiches most days but now, he usually takes leftovers because they are healthier and taste better. -Flatout wraps- We absolutely love Flatout wraps because they are whole-grain, healthy and taste great. We use these for so many different things including wraps, pizzas, quesadillas, salads and more. We love making sandwiches and wraps for lunch packed with all kinds of nutritious foods using Flatout wraps. I also like to use them in uncommon type recipes such as my Pizza Panzanella Salad, Easy Pizza Soup and Fattoush Salad. My daughter, husband and I all like them. Make these Mushroom Black Bean Burgers ahead of time and store them in the freezer. -Veggie burgers- We love veggie burgers and can get dinner on the table in 10 minutes or less with these! -Frozen vegetables- peas and corn mostly- I use frozen corn for my Texas Caviar black bean salad. Try this Salted Caramel Baked Oatmeal for a delicious, homemade breakfast before school! -Nut butters- you knew that I was going to say this, right? I only write about nut butter at least weekly. I love having a variety of kinds including peanut, cashew, almond, sunflower seed and pistachio butters. -Healthy (or semi-healthy) snacks such as nuts, dried fruit, popcorn, whole-grain crackers, etc. -Applesauce and pouches- Adalyn loves these for snacks.